Cypraea (erosaria) lamarckii Gray, 1825 is named after the French naturalist Jean-Baptiste Pierre Antoine de Monet, Chevalier de Lamarck, who is commonly known simply as Lamarck. Lamarck’s cowrie is a very attractive medium/small shell, typically 25-40mm, fawn or gold color and covered with small white spots of varying size. The margins are whitish with dark brown spots that distinguish it from the similar Cypraea miliiaris Gmelin, 1791 which has solid white margins. Although the coloring is relatively constant there is much variation of shape and size. The largest shells come from the African continent and are globose, relatively light in weight. 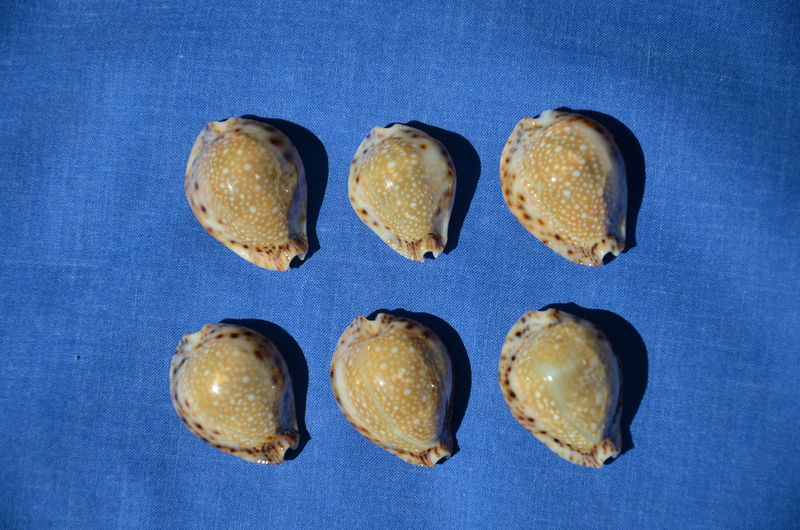 Here Cypraea lamarckii is found in shallow water where it burrows in muddy sand, emerging at dusk to feed. This is unusual as cowries do not burrow! In Tanzania there is one population with a purple base named Cypraea lamarckii fainzilberi Lo. & Ho., 1993 and a very pale variety Cypraea lamarckii sharoni Walles, 1980. Deep water populations from the Andaman Sea tend to be considerably smaller and lack the mantle line that is universal on the African specimens. Cypraea lamarckii reditima Melville 1888 is found in Thailand. Here it’s habitat is more typical of other cypraea, under rock and in corals. It is relatively flat, heavy with a well developed callous, large dark marginal spots and a very rounded base. Cypraea lamarckii is an Indian Ocean species though the occasional population is found in the Philippines and beyond. It appears that in the South China Sea and Pacific Ocean lamarckii is replaced by its cousin miliiaris. Our three specimens are illustrative of the variety lamarckii is found. This reditima along with five others, are freshly collected and just arrived this past week in a package from Phuket, Thailand. 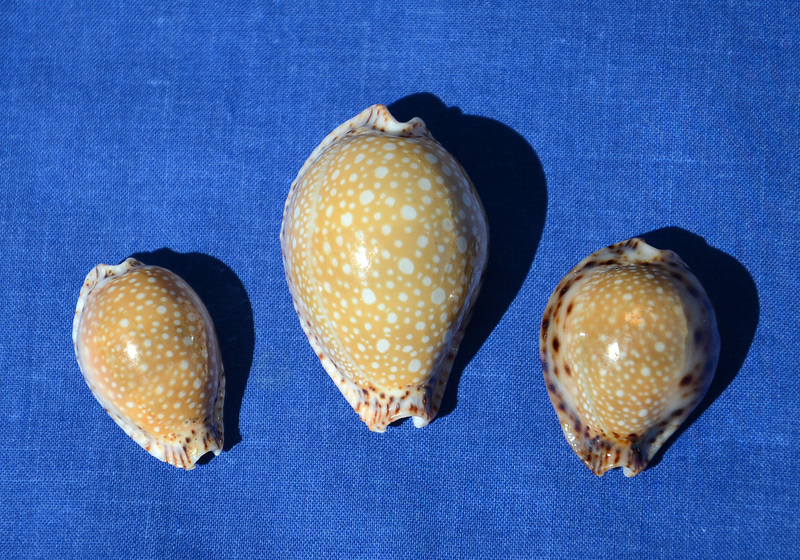 These three shells are donated from the collection of Richard Kent.